Welcome to the online mapping resource for the Yellowstone to Yukon Conservation Initiative - a collaborative of over 300+ conservation groups, government agencies, private land owners and other partners who are working to connect and protect wild lands and waters from Yellowstone to Yukon so people and nature can thrive. We work in this region and at this scale knowing we have a unique but urgent opportunity to stave off (and hopefully reverse) the loss of North America's celebrated large wild animals. 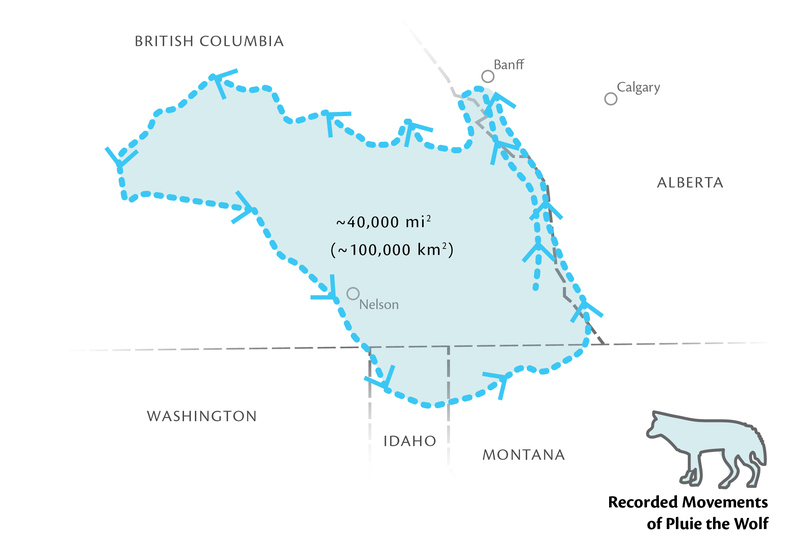 As the map of a wandering wolf shows below, we work at this scale because the animals are telling us to. Wide-ranging animals like wolverines, grizzly bears, elk and trout need to roam not just within protected areas but between them to find unrelated mates and avoid wildfires, floods and diseases. Connecting habitats across state, provincial and federal borders will become even more important as the climate changes and all organisms - even trees and other plants - will need to shift their ranges to find the temperature and moisture conditions they need to survive. Spatial information is organized within this Atlas in three ways: by theme, by area, and by the progress we've collectively made on the Y2Y vision so far. Please explore and create your own maps. If you'd like to become a part of this exciting effort please contact the administrator.